Lowe's must have known its human-size robotic "shopping assistants," which are rolling out this holiday season, would be mocked, right? They couldn't possibly have believed that people would just let that slide. Enter John Oliver and Nick Offerman. The Last Week Tonight host, who expertly skewers corporate buffoonery of all kinds, smartly posits that employees at home improvement stores aren't just there to sell you stuff—they're there to referee the impending nuptial doom that such stores cause. 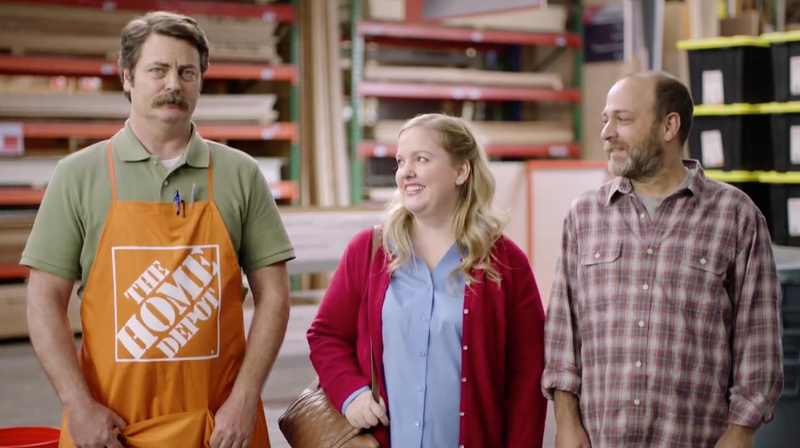 Check out Oliver's fake ad below—showing the nonrobotic, personal touch of rival chain Home Depot's employees, as epitomized by macho do-it-yourselfer Offerman. It's a great bit, with hilarious performances, too, by Louie guest star Sarah Baker and Archer/Bob's Burgers genius H. Jon Benjamin. Oliver isn't wrong about these stores and the tension they cause, either. There's even a scene in He's Just Not That Into You where (2009 spoiler alert!) Bradley Cooper reveals to Jennifer Connelly that he's been cheating on her in a Home Depot.